When driving on the M8 motorway, one of the few highlights is crossing the Kingston Bridge. For a brief moment a view opens out, up and down the Clyde in the centre of Glasgow. It has been so long since I have strolled along the Broomielaw that there have been a couple of new bridges built in the meantime. It was high time I returned to old haunts. The first bridge is pedestrian-only, and connects the warehouses of Tradeston with the new financial district that has sprung up along a previously run-down waterfront. I'm not sure of its name, but as the one further downstream is called the Squinty Bridge, I'll call this one the Squiggly Bridge. Its wavy passage across the Clyde does not annoy as you might expect (if one wants to get from one side to the other as quickly and efficiently as possible) and although it looks clunky from a distance, when on it it has a certain grace. The next new bridge, just a mile downstream, is the Squinty Bridge, so-called because it crosses the Clyde at an angle. A quick march and a cup of tea to follow at the SECC, across Bell's Bridge to Pacific Quay, but then an attempt to return along the south side of the river was thwarted by a couple of high metal fences, forcing a detour in to Tradeston. However from the south bank the old Finnieston Crane looks imposing, one of the few reminders of Glasgow's old heavy industry. Despite the redevelopment of new bridges, flats, financial backoffices, the SECC and BBC HQ, the Clyde at this point remains quiet, even desolate, the wind whipping up the river and across the deserted promenade. Like the windswept plazas of the new V&A in Dundee, architects with little understanding of the Scottish climate have created an area that is redeveloped yet not particular pleasant for urban living. However it is good to see some long-overdue care and attention being given to redeveloping the Clyde, even if it is not quite there yet. I can't help feeling that Glasgow is on the cusp of a big change, one for the better. It has been a city of decay for the last 40 years, and the redevelopments that have happened so far have been largely cosmetic. So the next wave of redevelopment will hopefully go deeper than just new buildings. Red Clydeside died over a generation ago. The time of the green Clyde is surely imminent. 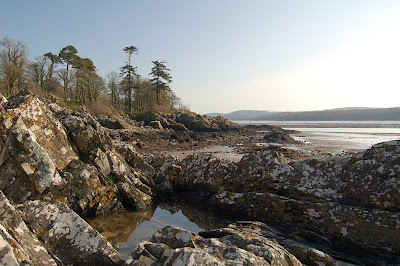 My last post was on the coast at Kirkcudbright. On the way back we visited Threave Castle as well. Threave was built by the norsely-named Archibald the Grim, 3rd Earl of Douglas in the 1370s on a small island in the River Dee, using the river as a natural moat. 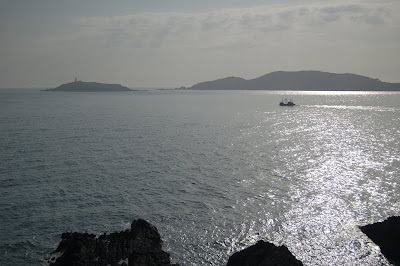 This gives a very pleasant approach: after a walk of a mile from the car park, you get ferried over to the island. The island was Archie's family's sanctuary. They needed one. His ancestor the first Earl of Douglas, James, had been Robert the Bruce's indispensable right-hand man (to the extent that English nursemaids crooned to their bairns "hush pet, the Black Douglas shall not get ye") but the Black Douglas family has grown so powerful in the intervening years that the Stewart kings, and their regents, had decided to cut them down. A couple of extra-judicial murders brought the king and the Douglas family into open warfare. 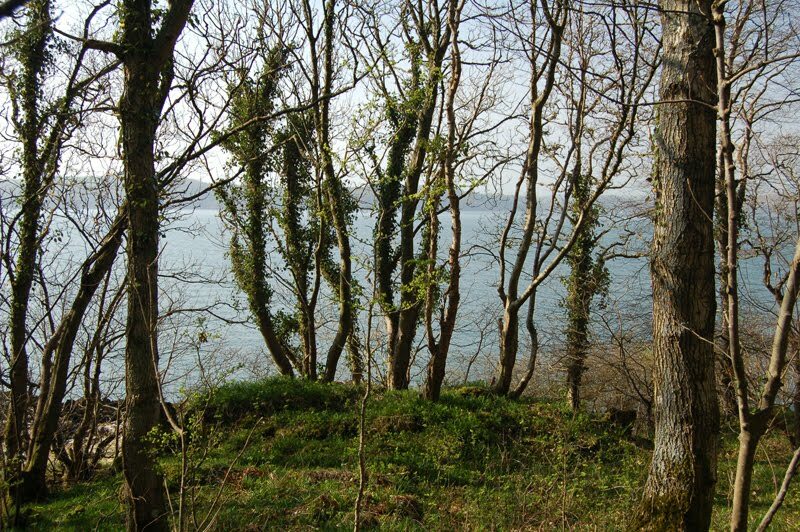 In 1455 James II brought his artillery to bear and James Douglas, the 9th Earl, hastily erected a defence - but the castle was abandoned after the assault and the fall from power of the Douglas line. 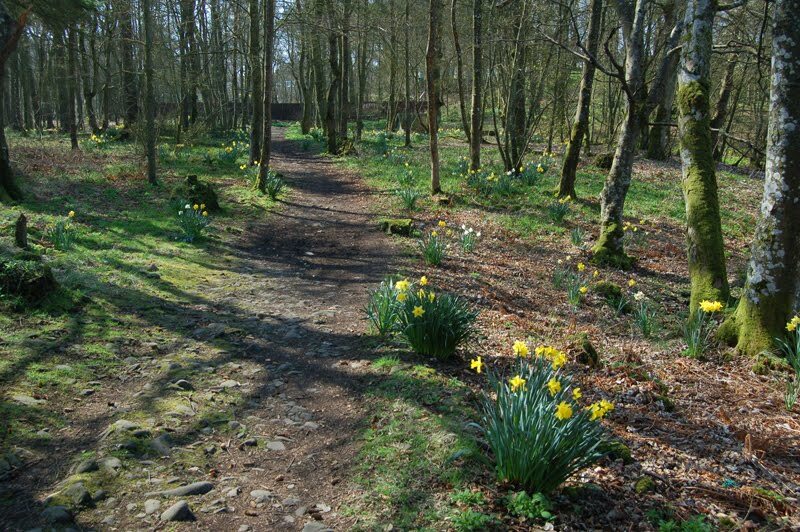 With no Douglas left, and its naturally awkward to reach site, the great keep of Threave was left preserved in mid 15th-century amber, and this spot is now one of the loveliest and most peaceful of all Historic Scotland's properties. The keepers certainly seemed content with their lot - no doubt the sunny weather helped. Strolling along the riverside after visiting the castle, we saw a giant nest with a pair of ospreys in attendance. I'd no idea there were ospreys in this part of the world, and we hadn't brought binoculars. But a fellow with a telescope turned up and let us have a look. "Six mating attempts already," he said, "this is the seventh." So that's what they were doing! As we weren't experienced bird watchers, it had not been possible to tell. It felt a bit voyeuristic. Whenever I see a very large lens, I can't help thinking of Princess Diana and the paparazzi. But these ospreys were oblivious, doing what comes naturally. 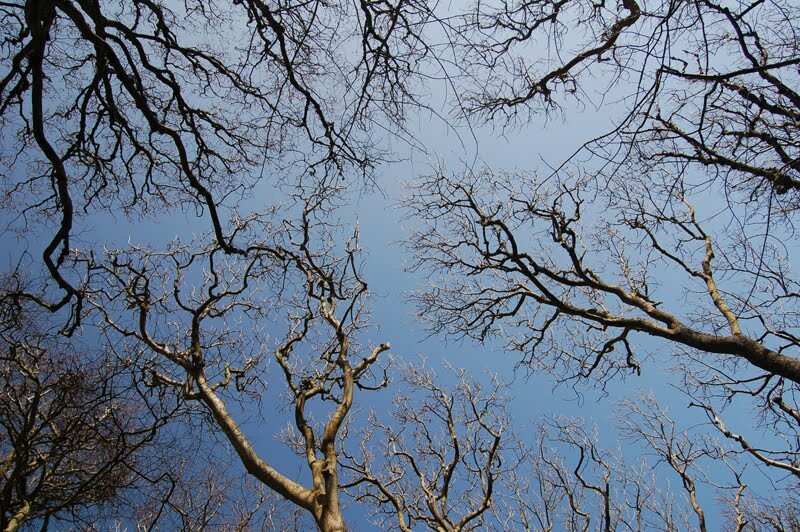 Spring is in the air. For an April taste of summer, the place to go is the Scottish Riviera - a.k.a. 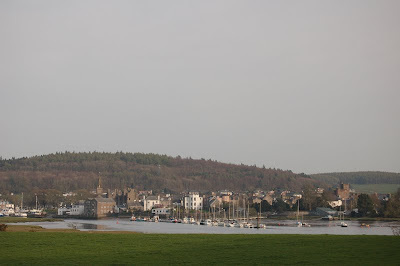 the Solway coast, and its central town, Kirkcudbright. Kirkcudbright is an attractive town at the head of one of Scotland's few rias, a coastal area of extensive mud that floods every tide. 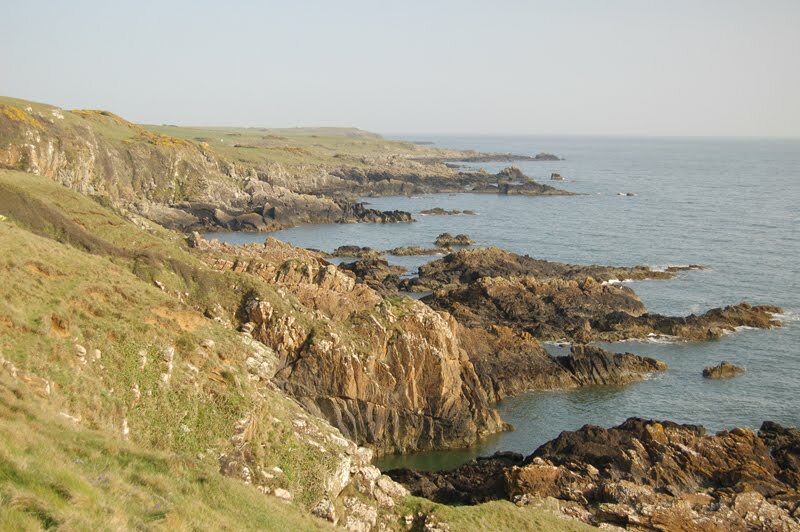 Kirkcudbright Bay is a paradise for birdwatchers, with a few sandy beaches, guarded at its seaward end by low, rugged cliffs. Let's have a walk along these headlands! 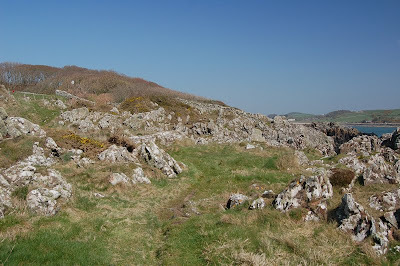 The first headland walk starts at Brighouse Bay, just round the corner from Kirkcudbright. This has a beautiful beach, the tide going out miles. Children splashed in the limpid waters and a canoeist paddled into the bay for a look then paddled out again. 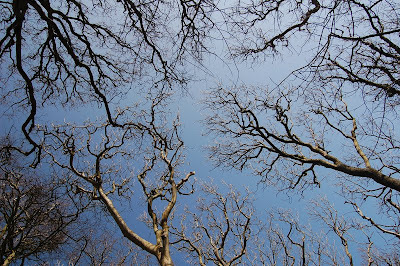 The walk from Brighouse takes you through a beautiful wood. 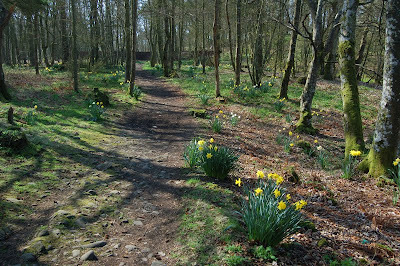 Today it is full of daffodils - as is much of Galloway - but in a few weeks it will be carpeted with bluebells. 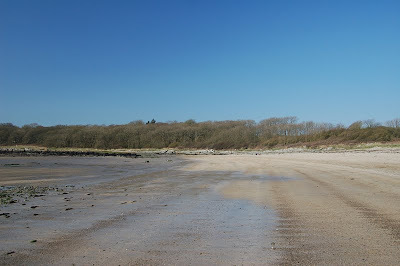 The headland at the other side of Kirkcudbright Bay (reached from Brighouse after a short drive via ice cream in Kirkcudbright) is Torrs Point. 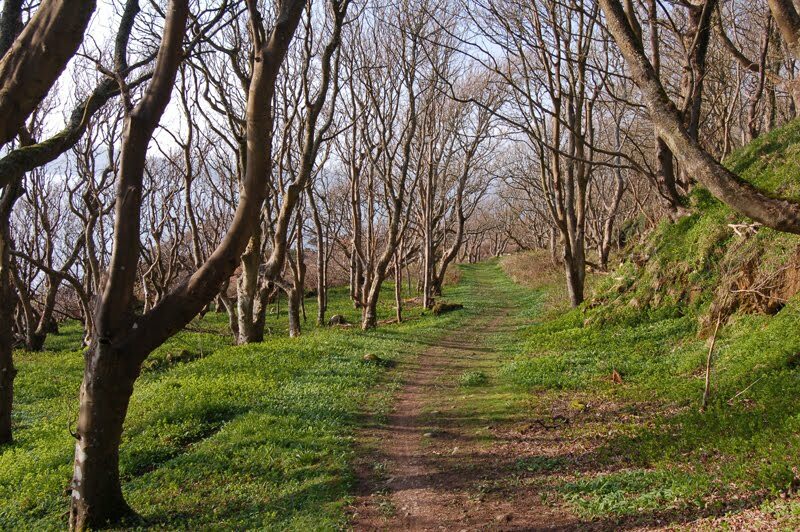 This leads through an equally beautiful wood to an even more rugged foreland. 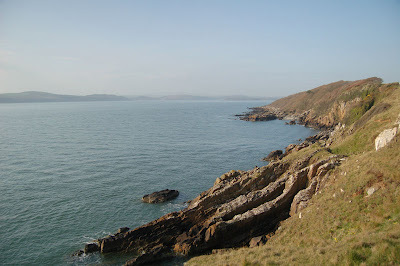 From Torrs Point, Little Ross with its lighthouse can be seen. 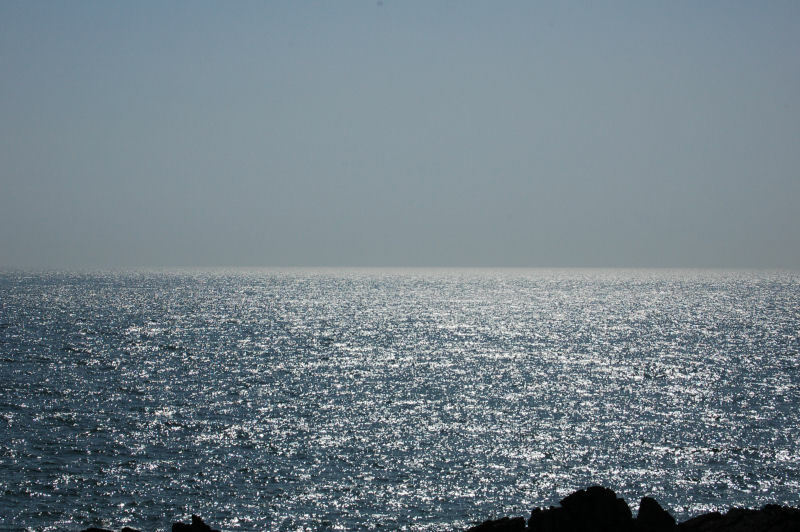 This is a peaceful spot, but has seen tragedy within living memory. The air round here was heavily scented with gorse, a smell similar to coconut. 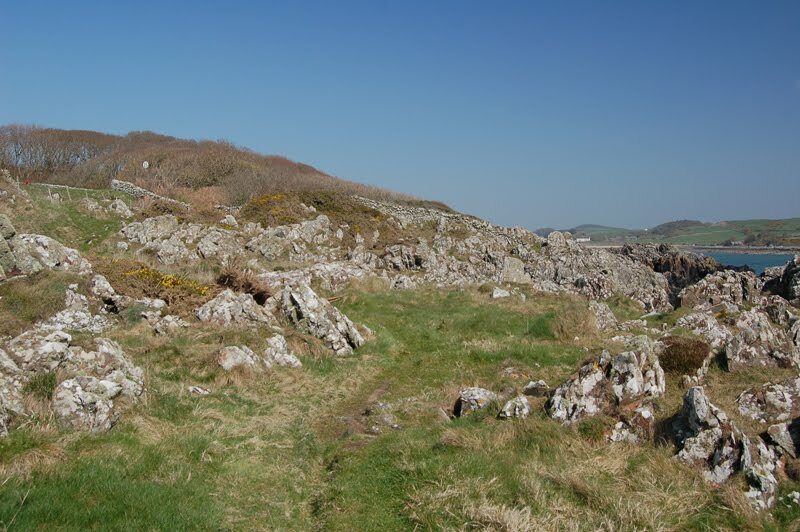 The sun-bleached rocks in outcrops and in drystane dykes are covered in a white lichen, reflecting even more light back to the eye, giving the place a feeeling of the green and white of Ireland rather than the more familiar brown and purple of Highland Scotland. 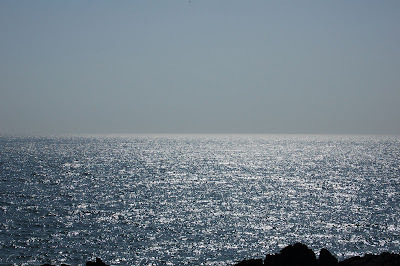 What a tonic the sun and sea air are at this time of year! Kirkcudbright hosts a big arts festival in the summer, when over 80 venues - including artists houses - are open to the public. But perhaps we won't be able to wait that long. 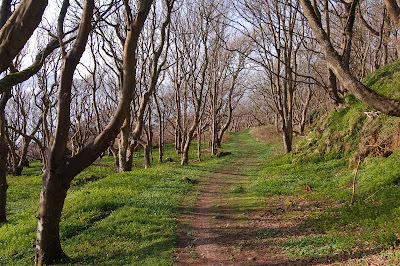 Given the same weather, we might be down again as soon as May for bluebell season. December 2010. Not only did we have a lot of snow but I learnt the hard way one of modern life's great lessons - *back up your data*. Whilst doubtful of what he should do, Bruce was looking upward to the roof of the cabin, and his eye was attracted by a spider endeavouring to swing himself from one beam in the roof to another. The insect made the attempt six times without success. It came into Bruce's head that he himself had fought just six battles, and the persevering spider was in the same situation with himself. "Now," thought Bruce, "I will be guided by the luck which shall attend this spider. If the insect shall make another effort to fix its thread, and is successful, I will venture a seventh time to try my fortune in Scotland; if not, I will go to the wars in Palestine and never return to my native country again." While Bruce was forming this resolution, the spider made another exertion and succeeded in fastening its thread on the beam which it had so often in vain attempted to reach. Bruce, seeing the success of the spider, resolved to try his own fortune. ... so what are you waiting for?! 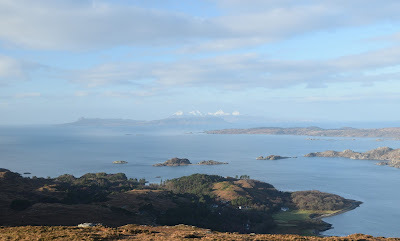 In my last post out and about, I waxed lyrical on Meall Mor, a tiny hill with a huge view. There are plenty more in that glorious area between Loch Etive and Badenoch: my favourite probably being Beinn a' Chrulaiste. 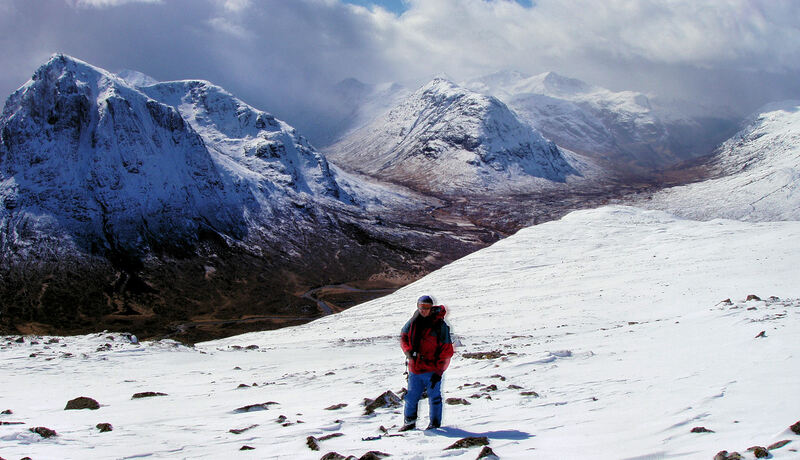 Beinn a' Chrulaiste is a Corbett, a steep but dumpy hill surrounded by the supermodels of the Scottish hills, the Buachaille, Bidean nam Bian, Aonach Eagach, and Ben Nevis. 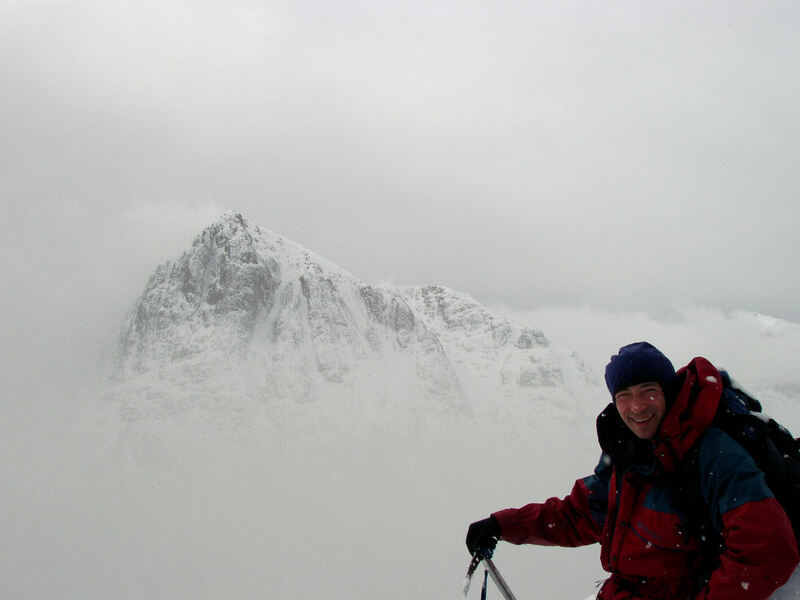 It is probably the finest viewpoint for the Buachaille Etive Mor: Boswell, as I said in my book, to the Buachaille's Johnson. Billy and I climbed Beinn a' Chrulaiste on a day of unexpected heavy spring snow. We headed straight up the main face of the hill, looking for a scrambling rib that I had been up in summer. As we walked along the West Highland Way looking for the rib, a snowstorm closed in. Oh well, no view for us! We headed straight up on slippy wet snow, unstable heather and iced-over rock. It was getting a bit serious. I looked down. It wouldn’t do to fall! Billy didn't look happy. At the top of the ever-steeper slope lay a line of broken cliffs. I refused to tackle them. Billy traversed and shouted for me from round the corner. I followed his footprints to find us on easy ground, Billy grinning. The sun had just come back out. We had been so engrossed in the difficult terrain that we hadn’t noticed it had stopped snowing. The Buachaille was shrugging off the mists, its majestic peak thrusting up through the clouds, spindrift trailing off its pointed summit. We sat in astonishment as the weather cleared, the Buachailles and Glencoe peaks appearing fresh-snowed and achingly beautiful, mountain butterflies shedding their cloud chrysalises. We laughed and grinned at the contrast with the hard terrain and weather of just a few minutes earlier. It had turned out to be the best of days! Descent was made on easier ground, via the subsidiary top of Meall Bhalach. Beinn a' Chrulaiste is one of those tops I don't think I will ever tire of visiting - but today's conditions would be hard to beat!